It’s no secret that I have difficulty planning meals for myself. Feeding myself has always been more of an afterthought, but with the pregnancy “afterthought” is no longer an option. I really struggled during the first trimester just trying to find food that I wanted to eat for more than 2 minutes at a time. While the second trimester has been easier, I still don’t know how long I’m going to want a particular food. Breakfast has proven to be especially difficult to plan for. I really would like a simple bowl of cereal, but that’s not a possibility, so after a month or two of eating breakfast muffins I decided I needed a change. Right after Andy and I switched over to grain-free eating, I found a recipe for granola that used nuts and seeds as the base rather than oatmeal. While I couldn’t remember where I had found the original recipe, I had a pretty good idea I could figure it out on my own. And let me tell you this granola hits the spot! Most mornings I eat a little bit over some plain Greek yogurt with sliced banana, but if I’m feeling even lazier, I’ll just pour a small bowl and eat it with some kind of milk (usually almond or cow). Granola is super forgiving (as long as you don’t burn it!). If you don’t like walnuts, swap in some extra almonds or cashews. Prefer ginger and nutmeg to cinnamon? Go for it! This recipe isn’t super sweet, so you can always add more sugar if you want, but I think it’s perfect just as it is. One last thing–because this granola base is all nuts and seeds it will fill you up faster than you realize. Start with a small amount and go back for seconds if you need it. In a large bowl combine nuts, seeds, and coconut flakes. Add butter, sugar, spices, and salt. Stir till everything is combined and evenly coated. Shake granola onto a cookie sheet making sure to spread everything out. Bake for 15 minutes. Stir the granola in the pan, then bake until golden brown (usually another 10-15 minutes). Watch the granola carefully as it goes from golden to burned very quickly! Allow granola to cool to room temperature then add cranberries. Store in an airtight container. * If I’m feeling really decadent, I’ll add a small amount of cocoa butter as I’m melting my butter. It adds a little hint of “What is that amazing flavor?? ?” to the granola without making it too chocolatey. ** Any kind of sugar will do here–white, brown, coconut, maple syrup, honey. Go with whatever you have. Lately I’ve used either maple syrup or coconut sugar. This dinner came about through delicious happenstance. I was interested in making a sausage and veggie gratin, but that felt a little too heavy for the warm(ish) weather we’ve been having lately. I decided to lighten it up with chicken and zucchini. The bacon and mushrooms add amazing flavor, and the leftovers taste even better than right out of the oven. Look at all that melty cheese! Place a skillet over medium-high heat. Add oil and saute the onions with a pinch of salt until translucent. Stir in mushrooms and cook until they begin to brown and let off some of their water. Add zucchini and another small pinch of salt (small being key. The bacon is pretty salty on its own, and you don’t want to over do it!). Give it a good stir and let it cook until the zucchini starts to soften just a bit. Stir the chicken and bacon into the veggies, taste, and season with salt and pepper as needed. Top with the cheese if you’re using it. Pop into the oven for 15-20 minutes until the cheese is melty and just starting to brown. Serve with a side salad if you feel you want an extra serving of veggies! * I find that 2 chicken thighs is perfect for me and Andy. 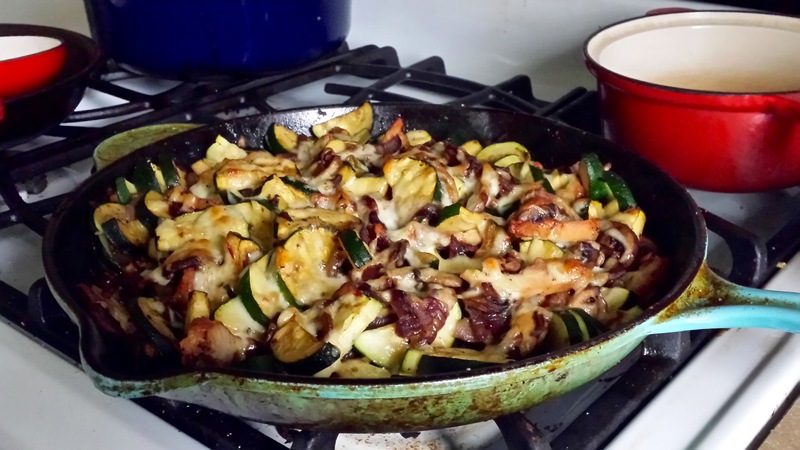 The bacon and all the veggies make this a complete meal without a huge amount of meat. If you’re serving more people, increase the chicken thighs by 1 per extra person. ** I don’t specify which type of cheese, because really melty cheese is melty cheese. I’ve made this with a hard English cheddar and it was just as good as when I used pepper jack. Check your fridge and use what you have on hand. Growing up my family made up names for certain foods. On Thanksgiving and Christmas my youngest brother and I would fight over the “pink stuff” (to all you mid-westerners out there, I believe you call it Jello salad) a fluffy concoction of raspberry gelatin, Cool-Whip, canned pineapple, and cottage cheese. Totally gross. Totally delicious. My brothers’ favorite meal was Yummy Boulet (rhymes with “Goulet”, as in Robert). To the best of my recollection Yummy Boulet consisted of ground beef, tomato sauce, and elbow macaroni. It wasn’t on my top 10 list, but the name stuck. All this being said, I’ve carried on the tradition with my own cooking, and I want to share with you what Andy and I lovingly refer to as “cabbage meat thing”. It started out by trying a recipe for deconstructed cabbage roll casserole (for the life of me I can’t find the original recipe). Basically you chop and saute cabbage with traditional stuffed cabbage ingredients and bake it like a casserole. The second inspiration for this dish was the Garbage Stir fry from Nom Nom Paleo. At first glance neither the casserole nor the Garbage Stir fry seem like much, but they were so good! I found myself making them every other week or so. This got me thinking, if Cabbage + Meat + Onion + Sauce was such a winning combination, maybe I could branch out into other flavors to shake things up. And that’s how cabbage meat thing was born. The flavor possibilities are limitless, it’s typically less than 5 ingredients (outside of the oil, salt, and pepper), and it can be made and baked in a single skillet. All of these add up to a winning weeknight meal for us. Here are the basic components followed by some ideas for changing up the flavors. Enjoy! Heat the oil in an oven-proof skillet over medium high heat. Add the onions with a pinch of salt and cook till translucent. Add the meat with another pinch of salt and stir, breaking it apart, until brown and cooked through. Stir in your seasoning, and tomatoes or sauce if using. In batches, add a handful or 2 of the chopped cabbage at a time, tossing everything carefully together. The cabbage will add a lot of “heft” to the dish initially, but it’ll cook down. Continue to add the cabbage and toss with the saucy meat until everything is incorporated. Place the skillet in the oven and bake for 20-25 minutes until the cabbage starts to look a little “crispy”. I like a little char. You may not. If you prefer your cabbage to be silky not crispy, start checking it at the 15 minute mark. Recipe notes: Here are a few of our favorite flavor combinations. Use these as a jumping off point, and share if you come up with something brilliant! – Enchilada: 1 pound cooked shredded chicken (or ground beef/turkey) + cumin + 14 ounces enchilada sauce (bought or homemade). After Andy’s Type 2 Diabetes diagnosis, we had to relearn how to eat. No longer could Friday nights involve 2 large pizzas (1 for each of us! Don’t judge. There were leftovers. Sometimes. ), and we couldn’t pop into the 24 hour donut place down the street at midnight on Saturdays just because “we felt like it”. At first we struggled. Veggies just didn’t hit the spot the way a blueberry cake donut did. But we adjusted out of necessity, and then out of actually wanting to adjust. We realized that as our lifestyle changes took effect, we felt better than we ever did before. Not to mention the weight loss and blood sugar numbers coming down. I read a lot of food blogs and there’s a lot of food out there that Andy and I can’t eat. I’ve learned how to take the idea of a recipe and update it with ingredients that Andy and I love. This recipe–based on this recipe from The Kitchn–is a testament to how our eating habits have evolved. The original recipe includes rice, corn, and beans–a classic Tex Mex combination–all things that Andy and I avoid, or at least try to keep to a bare minimum. I knew that I could add extra peppers, onions, and swap the rice for cauil-rice and have a great meal. And indeed it is! You’ll notice the lack of protein in this dish–Andy and I typically eat this with fried eggs and salsa on top. Run the cauliflower through your food processor with the shredding blade attached. Alternatively, grate the cauliflower until it is the size of rice. Set aside. In an oven-proof skillet saute the onions and both peppers with a healthy pinch of salt until onions are translucent. Add the spices, stir to combine, and let cook for a minute or two until everything smells “toasty”. Add the tomatoes and stir again. Stir in the cauliflower with another large pinch of salt and a few grinds of the peppermill. Make sure all the onions and peppers are distributed and the cauliflower is fully coated with the spices. If you’re adding cheese stir it in now and pop the entire skillet into the oven for 20-25 minutes until brown and the cheese has melted thoroughly. I like ours with little charred bits of cauliflower on top. If you’re not of that persuasion, keep an eye on it around the 15 minute mark. Serve with eggs (fried or scrambled), sliced avocado, and copious amounts of your favorite salsa or hot sauce. If you’re curious about the name “Texy Mexy”, it’s an inside family joke. Ask me about it in person sometime and I’ll tell you. Whenever I try to tidy up my eating habits my biggest concern is how my food tastes. I’ve mentioned that I’m a picky eater, and there’s nothing worse than knowing I can’t have some of my favorite treats all the while being stuck eating bland, blechy, blah food. If my taste buds are bored, I can promise you I will cheat. When I first started the 21 Day Sugar Detox (21DSD) back in January I played around with smoothies for about a week before I came across the combination I’m sharing today. The 21DSD allows you either 1 green-tipped banana, 1 grapefruit, or 1 Granny Smith apple a day. For this smoothie I combined 2 halves of the allowed fruit to come up with a breakfast that is easy, filling, and oh so tasty. Classic creamsicle flavors are orange and vanilla. I’m not a huge fan of orange (unless it’s an orange cranberry scone, in which case get out of my way! ), and oranges aren’t allowed on 21DSD, so I thought grapefruit might be a nice substitute. The vanilla rounds out all the flavors and the two combined give a vague hint of something tropical. The avocado and coconut milk provide enough fat to sustain me until lunch, and the greens, flax, and maca are filled with fiber that keeps my digestion happy. Combine all ingredients except water in a blender* and process till smooth. Add water if the smoothie is too thick. I find that the banana, avocado, and coconut milk are thick enough without adding additional ice, but if I want the smoothie to be a little colder I throw 2-3 ice cubes in my glass as I’m drinking. * I don’t actually have a fancy high-powered blender. I make all my smoothies with my Cuisinart immersion blender and it works just fine. Every now and then I’ll find something that didn’t get processed, but it’s never enough to really bother me. Thanks to an abundant Easter brunch (we hosted Andy’s family and I made a little extra) we actually ate leftovers for dinner three times this week! That means I get to carry over a couple of last week’s meals into this week. You’ll notice the grocery list is a wee bit shorter, and that’s because we’ve got the ingredients for the pho and the chorizo rice bowl in the fridge waiting to be consumed. I (Liv) originally started making this chili for Andy 4 years ago for his lunch. One batch would typically last a week. After a few months, Andy took over making this and adjusted the spice level a little more to his taste. These days a batch of chili lasts about a month (he freezes each weekly portion and thaws it out each Friday for the following week). This combined with roasted cabbage and steamed broccoli gives him the perfect amount of fat, fiber, and protein to get him through his day. Heat your pan or pot over medium-high. Add olive oil, pinch of salt, and onion. Cook onion until translucent. Add turkey and another pinch of salt. Brown the turkey, then add all the spices to the meat. I like to combine all the spices in one cup and sprinkle them around so it distributes evenly. After the meat is thoroughly coated with the seasoning, add the tomatoes and 2 cans of water. Stir, then add the beans and chopped pepper. Stir again and allow to cook for 5 to 10 minutes. Turn the heat to medium-low and cook, uncovered for an hour and a half to two hours, stirring regularly so the bottom doesn’t scorch. You want as much water to cook off as possible without the chili becoming paste-like. *This amount of chipotle makes for a very spicy chili–too spicy for Liv. If you have a more sensitive palate, you may want to scale back significantly.